I already had a pumpkin bread recipe that I’d developed two years ago. In fact, that old one and the new one aren’t all that different except the old one relies yeast as an egg replacer while the new one uses extra baking powder and soda. The new one, though, is based on a banana bread recipe that I knew would ship safely to Afghanistan. That’s where Dad comes into the story. Dad is a pumpkin fanatic. The first time I made dinner for him, dessert was pumpkin cheesecake. His last dinner before deployed included pumpkin pie. I know the chow hall won’t let him go without during Thanksgiving, but we wanted to send him something, too. I based it on my banana bread recipe, which was based on Rosemarie Emro’s “Bakin’ Without Eggs” cookbook, that we’d shipped successfully back in the summer. The conversion from banana to pumpkin was simple and seamless. I simply swapped one amount of puree for the other. I also used whole wheat instead of graham flour because whole wheat was what I had on hand. I bet graham would be yummy, though. I used shortening instead of butter because butter can turn rancid. Not that excessive heat is a factor this time of year. The result: Pretty good as far as I can tell from the scant amount I’ve been allowed to sample. The guys plowed through half of one loaf in less than 24 hours. The other one is waiting to ship. The loaf is very firm and the outside is crunchy at first, though it softened quickly under the cake dome. It’s not overly sweet, which is why I let the guys plow through half a loaf in less than 24 hours. If you want a sweeter bread, try adding raisins or dates or increasing the sugar to a cup. That’s what the original called for before I doctored it. Cream sugar and butter for one to two minutes until light and fluffy. I doubled the recipe and used my stand mixer. I’d recommend a stand mixer even for a single loaf. My hand mixer never recovered from the banana bread. Slowly add pumpkin puree. Combine dry and add alternately with buttermilk, mixing well after each addition. 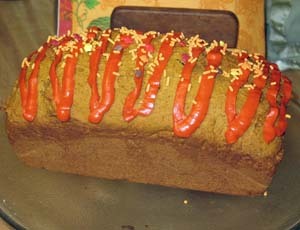 Pour into a 9x5x3 loaf pan coated with cooking spray. Bake 50 to 60 minutes at 325 degrees. Cool in pan for 10 minutes before removing.